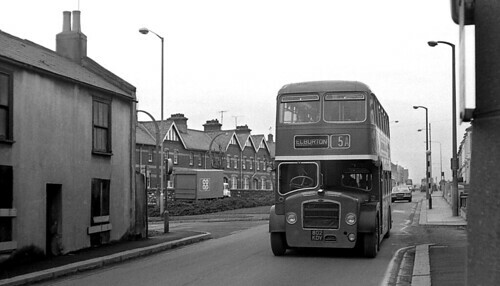 An early Western National Bristol-engined FLF Lodekka, seen in Embankment Road, Plymouth, on Thursday 6th January 1977. I think I was walking out to Laira garage, where I hoped to find one or two of the former Bristol Omnibus Co. FSFs that had now belonged to WNOC for ten years. I did find one, but photographable only from the rear. On Google Street View it looks as though the rank of houses on the far side of the road, behind the Co-op lorry, have been much remodelled, with most of the gables lost. The building on the left, which seems to be boarded-up ready for demolition, survives, although the chimney and door have gone and the windows been replaced.